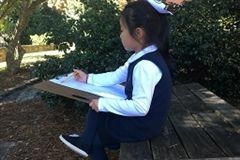 The Brookstone 3K and Pre-K are not stand alone programs, but are integrated into the overall Lower School curriculum in order to prepare our students for the next level at Brookstone. The 3K and Pre-K curriculum focuses on literacy and number sense, while including Spanish, art, music, physical education, and elements of science, technology, and engineering. The Lower School is in the business of growing voracious readers. Utilizing a workshop approach for reading, students do their reading work in real books instead of textbooks. Not only does this foster a true love of reading, this allows them to read more books each week than they would using a typical textbook and allows them to apply the reading strategies and skills they learn in increasingly more complex texts. The workshop begins each day with a mini lesson or strategy lesson where the teacher models and guides students in practicing a specific reading skill or strategy. Students then read independently, applying the skills and strategies they are learning, as teachers support their work through one-on-one reading conferences and small group instruction. The workshop closes with a time for reflecting on the day’s learning. The workshop model ensures that each child receives specialized reading instruction rather than a one-size-fits-all approach. The Lower School also utilizes the workshop approach for teaching writing. Structured like the reading workshop, teachers begin each day with a mini lesson focused on developing writing craft and skills. Students then work independently to try the skills and craft moves in their own writing. Teachers support this independent writing with one-on-one conferences and small group instruction. The workshop ends with a time for students to share their writing with peers. Throughout the writing process, students learn to give and receive constructive feedback to improve their writing. Students learn to write for authentic purposes and for real audiences in genre-based units of study framed around narrative, informational, opinion, and poetry writing. Students enjoy this approach as they are taught to live and work as writers, noticing, investigating, and reflecting on the world around them. This ultimately makes our students better writers by increasing the amount of time for writing in all genres and building their confidence, stamina, skill, and craft as writers. 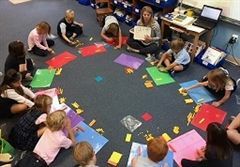 Singapore Math is a problem solving-centered curriculum based on the national math curric­ulum used in schools that desire to give students a deeper understanding of the concepts of mathematics beyond simply learning equations. Through this program, we deepen our students’ number sense and their ability to attack prob­lems, as well as develop their under­standing of the “why” in mathematics rather than just learning to apply a formula. The goal is to create engaged, motivated mathematicians with the ability to think critically and problem solve. M.A.S.T.E.R. is an acronym for Math, Art, Science, Technology, Engineering, and Robotics. M.A.S.T.E.R. 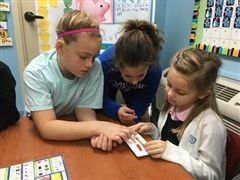 Lab provides a setting that allows students opportunities to use inquiry, critical thinking, and dialogue as they engage in hands-on experiments. As a guide on the side, the teacher encourages students to be persistent in exploring the world around them as they collaborate to create innovative solutions to problems, as well as communicate their results. In the Lower School, our students have the opportunity to take Spanish, which not only exposes them to another language, but also another way of life. Grades 3K through third study basic fundamentals of the language including greetings, days of the week, colors, family, feelings, weather, and food. Learning and experiencing other cultures also plays a vital role in our classroom. Students will connect with the Spanish cultures through dance, songs, food, and projects. Our students are immersed in the language, while learning in an authentic environment. Through many processes, media, and exercises, the students are taught to recognize the eight elements of art - line, space, shape, form, color, value, pattern, and texture. The Lower School art room is a place for experimenting, learning from mistakes, taking chances, and having fun, and the students are introduced to the work of famous artists, both current and historic. In the Lower School, we foster a love for all things musical! Students are introduced to various types of music, musical instruments, composers, and musical concepts. They are able to discover talents and develop self-confidence as each grade level, 3K through third grade, performs on the stage at least twice a year. The music classroom is a place of comfort and joy! ️‍Students are introduced to four main areas of physical education: movement education, ball skills, rhythmic skills, and games. Emphasis is placed on flexibility, muscle strength, aerobic endurance, body and spatial awareness, balance, locomotor and non-locomotor skills, and hand-eye coordination. In all activities, students are taught to apply the values of teamwork, sportsmanship, and integrity. As in all of our divisions, character education and servant leadership are an important part of the classroom experience.